Do you read aloud? Do you listen to the written word being read aloud? The rising popularity of audiobooks and podcasts seem to say that humans still respond to words spoken aloud, even in this culture of images. In both readings from scripture (Luke 4:14-21 and selected verses from Nehemiah 8), the word of God is read aloud. Ezra was, apparently, quite gifted at reading aloud. His reading brought the word of God to life in a way that touched the emotions of the hearers. The people listened, understood the reading, and wept when they heard the law of God. The gospel passage from Luke stops just before we see the reaction of the people to Jesus' reading and proclamation. The next few verses tell us that the people are "amazed" at Jesus' words...but not in a good way. Their amazement turns to rage. They drag him out of town and attempt to throw him off a cliff. No one can deny the power of the reading and hearing of these words. There have been other words that, when read aloud, have had the same kind of impact on its hearers. 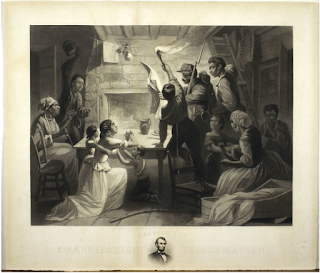 The two images at left are centered around the Emancipation Proclamation, issued by U.S. President Abraham Lincoln on January 1, 1863. The top image shows Lincoln's cabinet as they hear the Proclamation read for the first time. They don't show much (any?) external emotion as the words are read, though that may also be the painter's attempt to help them look serious and statesmanlike. The bottom image, published the same year as the painting was created, also depicts a reading of the Emancipation Proclamation. This time the reading is being done by a Union soldier surrounded by enslaved persons. The reaction of the hearers - members of three generations - is much more visible. Hands are raised in gestures of supplication, hats are being waved, eyes are lifted to heaven. I remember one of my seminary professors advocating that worshipers should hear big pieces of scripture in worship every week. Notice how that is phrased...not that we should read big pieces of scripture, but that the congregation should hear big pieces of scripture. Words of scripture spoken aloud promise us freedom and release, recovery of sight, and the joy of the Lord that is our strength. Perhaps we should be reading scripture aloud, even (especially?) if it's "only" to ourselves. These are words we need to hear. Top image: Francis Bicknell Carpenter. 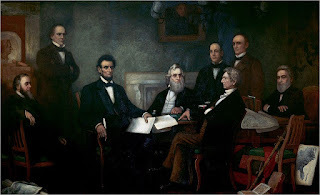 First Reading of the Emancipation Proclamation by Abraham Lincoln. 1864. Collection of the U.S. Senate. Bottom image: H.W. Herrick, del., J.W. Watts, sc. Reading the Emancipation Proclamation. 1864. Washington, DC: Library of Congress. This week on Art&Faith Matters on Facebook...someone reads a scroll.